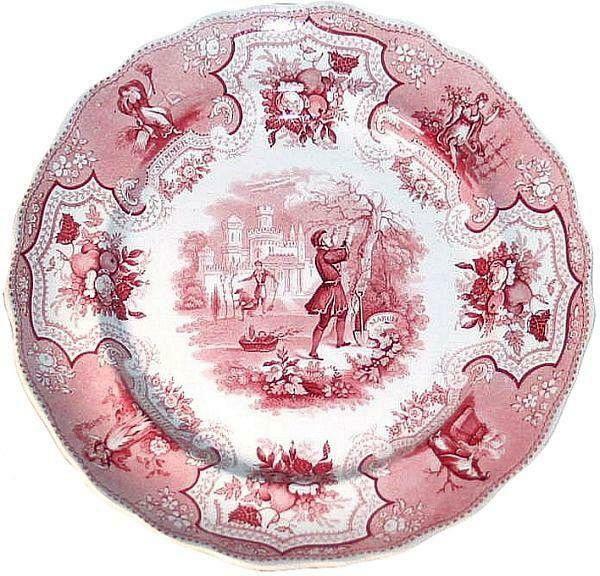 Wedgwood (1759-2005) 10 inch "March" plate with a Florentine border. You can see the word "March" on the bottom right of the pattern. 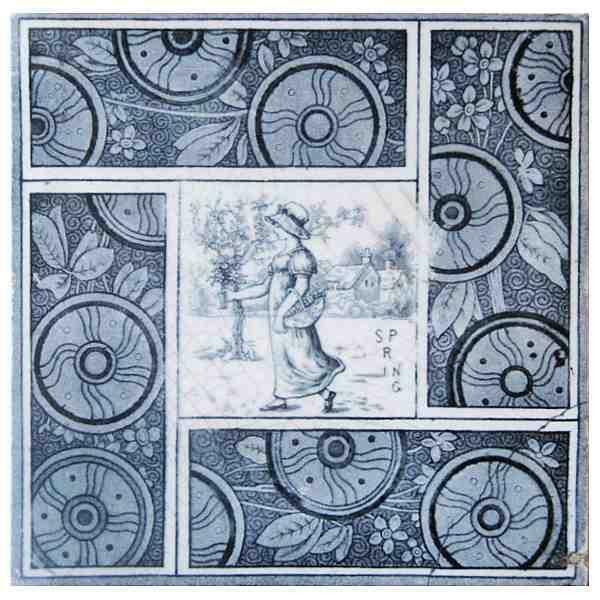 The Transferware Collectors Club Database of Patterns and Sources says: "The patterns were designed by Helen Miles who was a designer, painter and illustrator (fl.1860-1893). 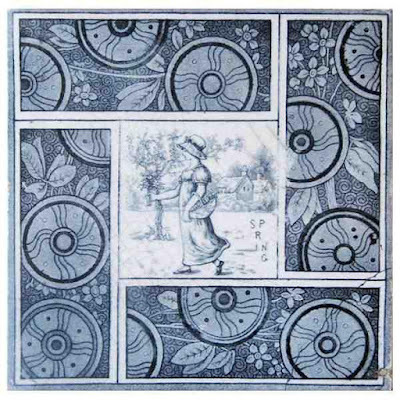 She designed several series of tiles for Wedgwood, including "Months". 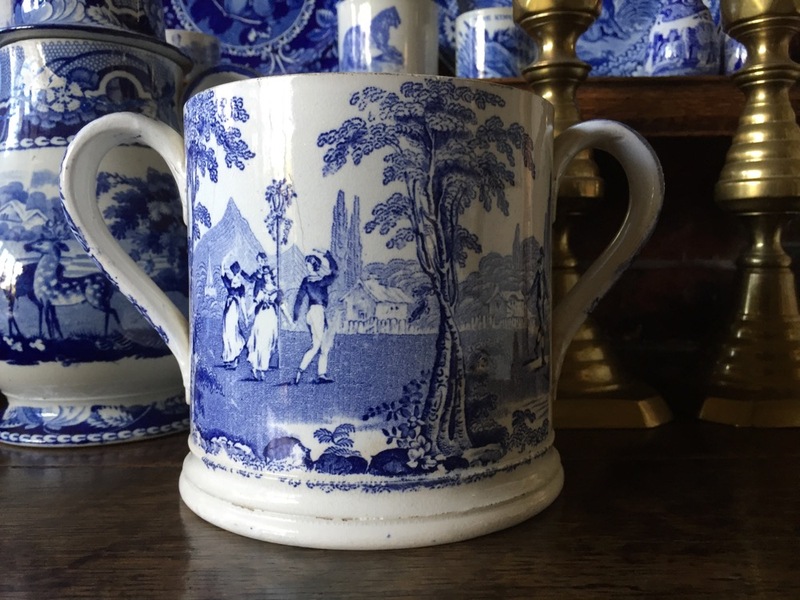 One of my readers was hoping to see some transferware March patterns. Here are a few, starting with a Wedgwood plate. 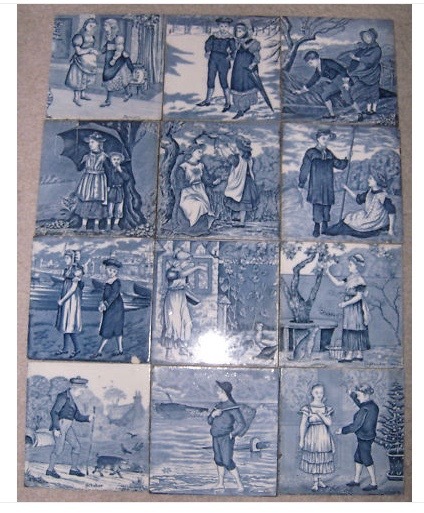 You probably know that Wedgwood made a series of month tiles. 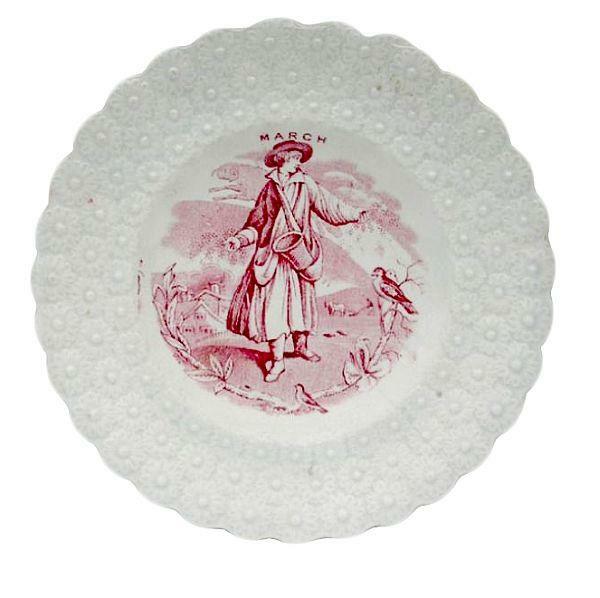 They were so popular that Wedgwood incorporated the designs onto plates surrounded by one of several Wedgwood border. Below are some tiles from the Wedgwood Museum in England. 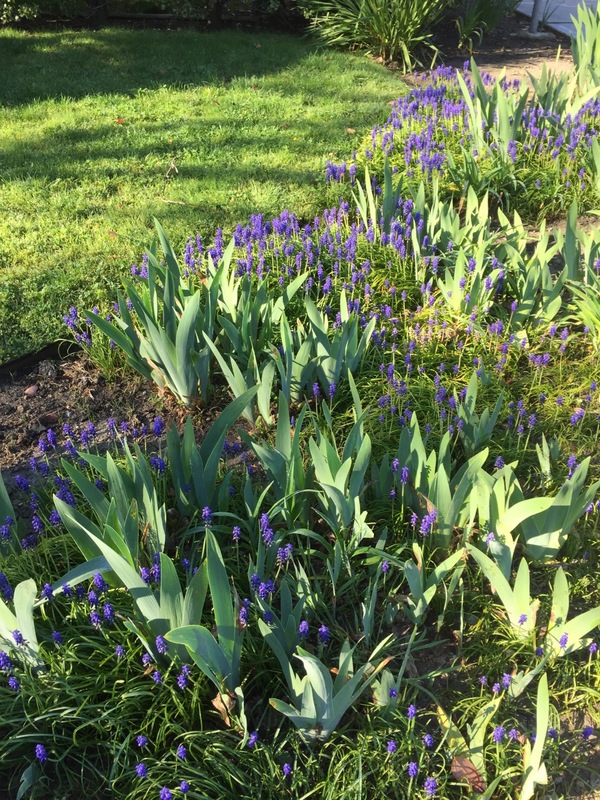 You can see March on the planter, as well as on the center left in the group of tiles. 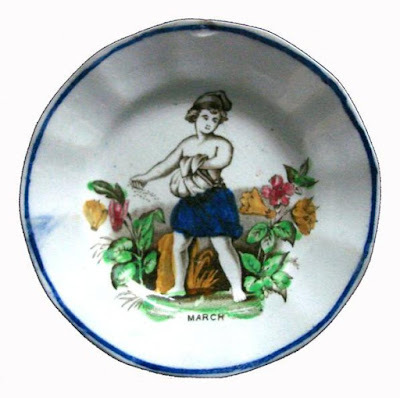 The month of March is also found on children's plates. They make excellent birthday presents. 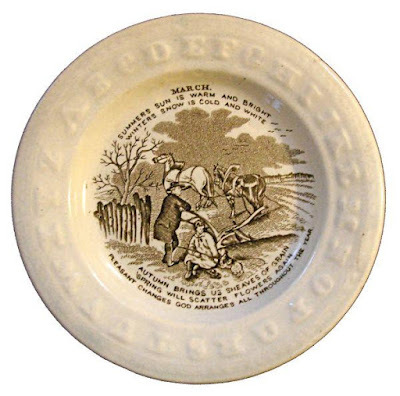 Scott (1800-1897) 6.5 inch "March" plate. If you enlarge the photo, you'll see a ram over the man's left shoulder. The ram or Aries is one of the astrological signs for the month of March. Ynysmeudwy Pottery (1845-1877) 6 inch "March plate. The child is casting seeds for Spring planting. The plate is one of a series of twelve. Maker unknown 6.62 inch "March" plate. 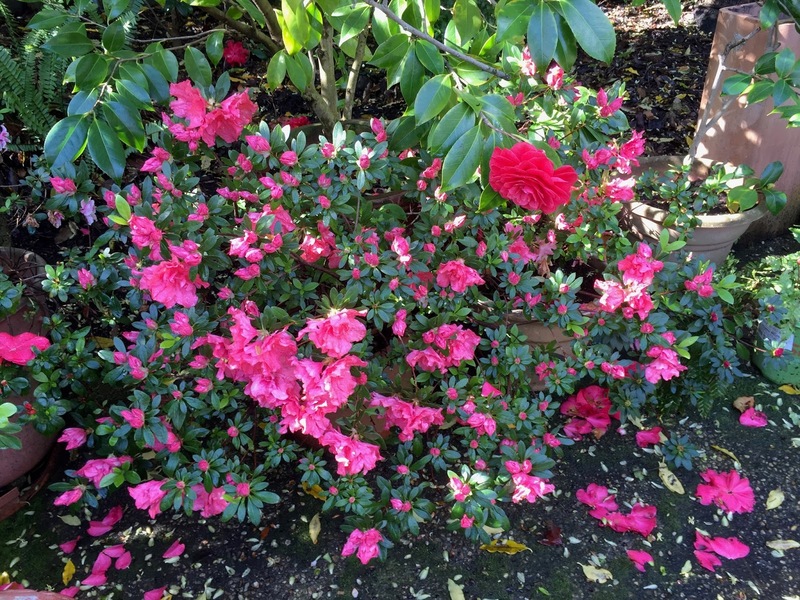 The scene includes planting as well as a seasonal poem. Notice the alphabet border. 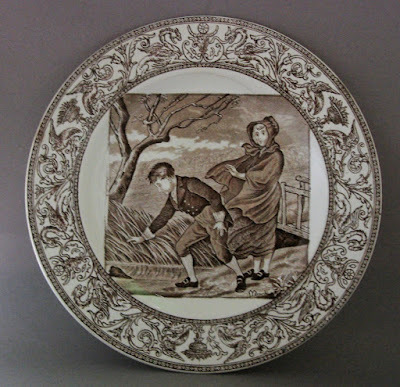 Below is a plate from Adams "Seasons" series that shows a man pruning a tree. A banner to the right of his spade says the word "March." William Adams IV & Sons (1829-1861) 9.5 inch "March" plate. The border includes four figures illustrating the four seasons. March is often illustrated with a windy scene. 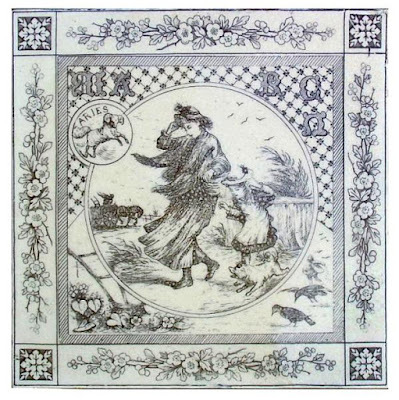 Below is a "March" tile with a woman and child holding their hats. Notice the ram under the word "Aries" in the the circle near the top left. Aries is one of the astrological symbols of March. Minton Hollins & Co. (1868-1962) 8 inch "March" tile. One more pattern. Here is a March child's mug. I find the text a bit confusing. Wouldn't the days of feasting and gluttony be over by January? 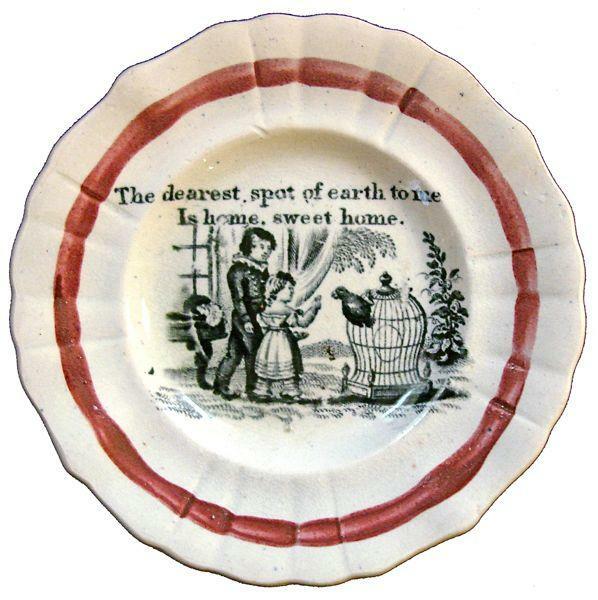 However, 19th century children's china was often intended to instruct, so here is a poem about gluttony. 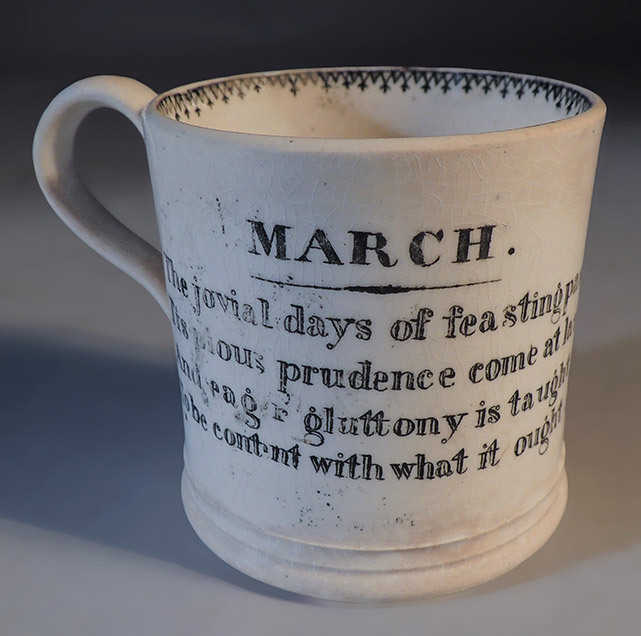 Maker unknown 2.62 inch "March" mug printed with the words: "The jovial days of feasting past/Tis pious prudence come at last/And eager gluttony is taught/To be content with what it ought." 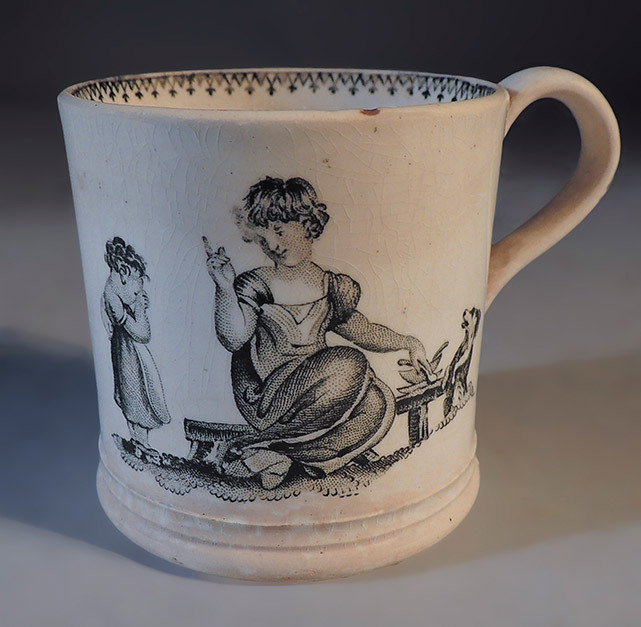 The other side of the mug show a mother of governess instructing a child about gluttony. Remember that all of the patterns that illustrate a month were part of a series. It would be fun to collect them all! 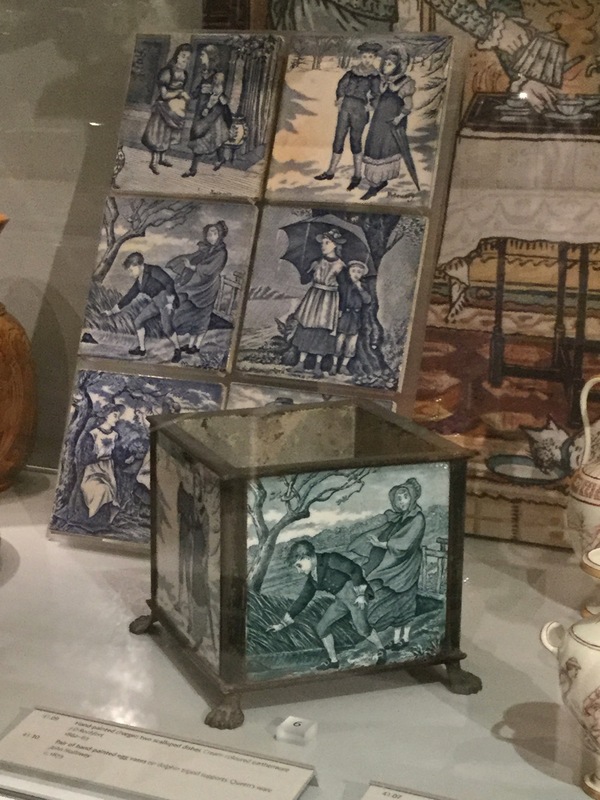 Wedgwood tiles depicting the twelve month of the year, ca. 1880. 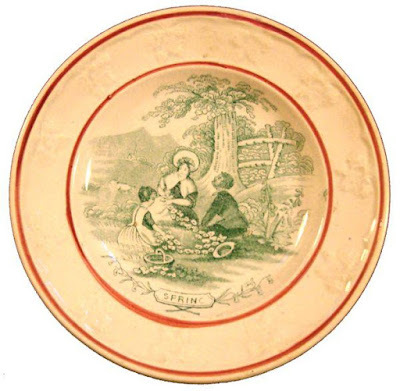 William Brownfield (& Son (s) 1850-1892 "Spring" pattern plate. 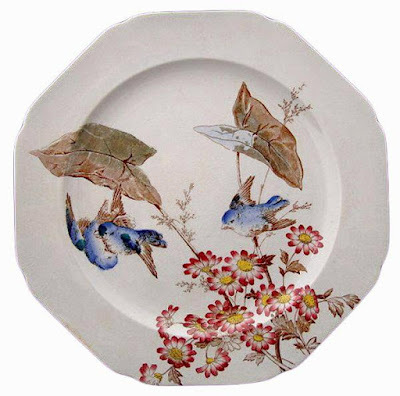 The vernal or spring equinox is March 20, so I thought I'd see if there were any transferware spring patterns. I found a few. 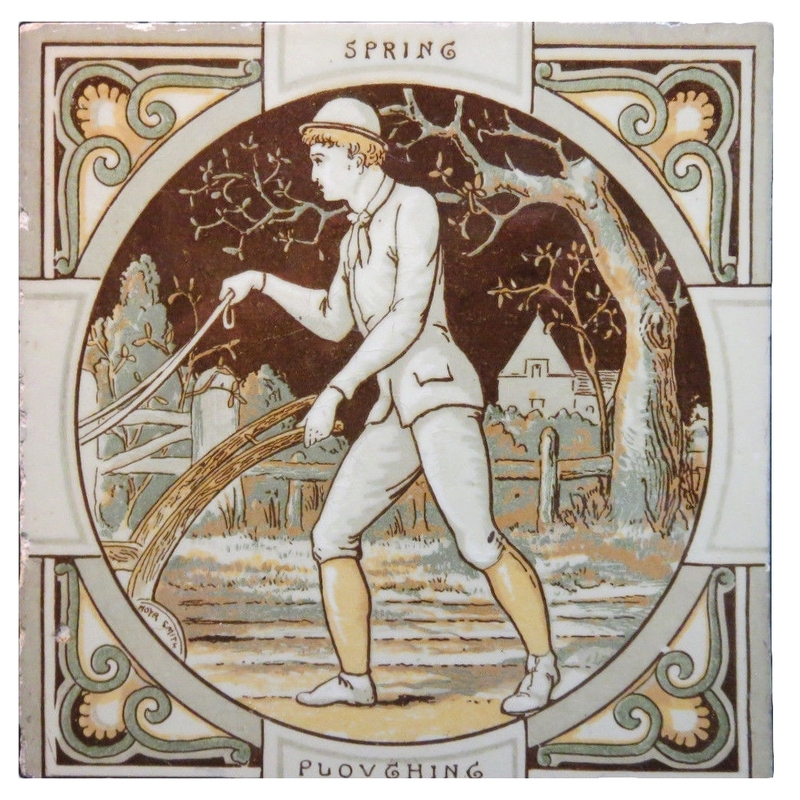 T. & R. Boote (1842-1906) "Spring" 6 inch tile. 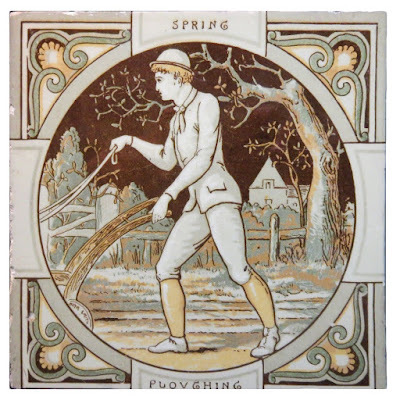 Mintons (1872-1950) 6 inch tile "Spring: Ploughing." 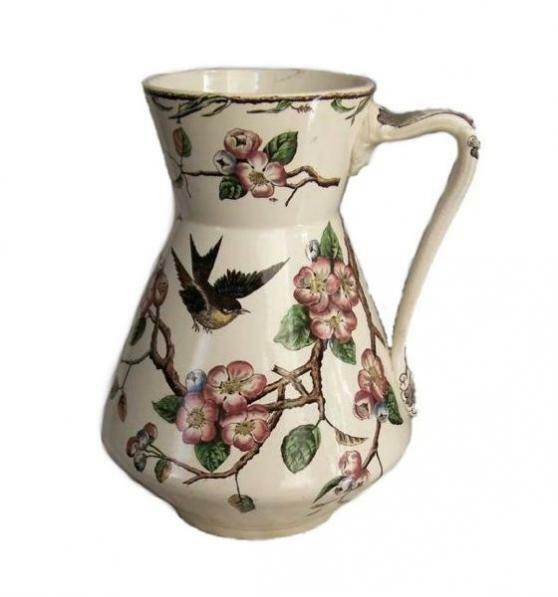 S. Fielding & Co. (1880-1917) "Spring" 12 inch pitcher. 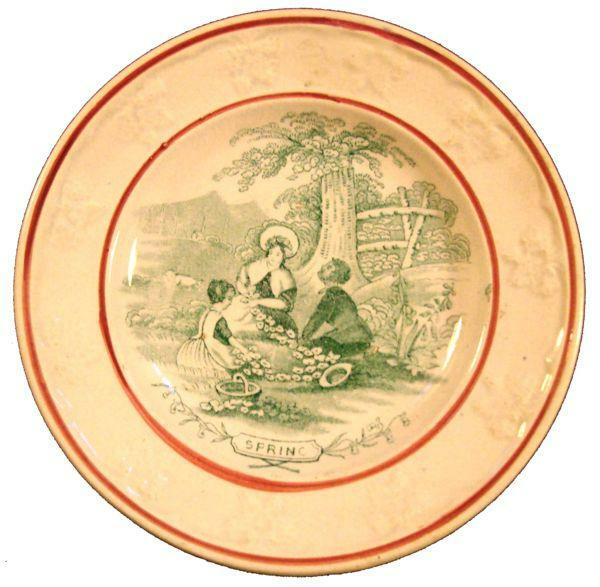 Maker Unknown, 5.56 inch child's plate titled "Spring." Spring flowers are also popular, so I thought I'd use this post to show you some photos of spring flowers in local gardens (and mine). 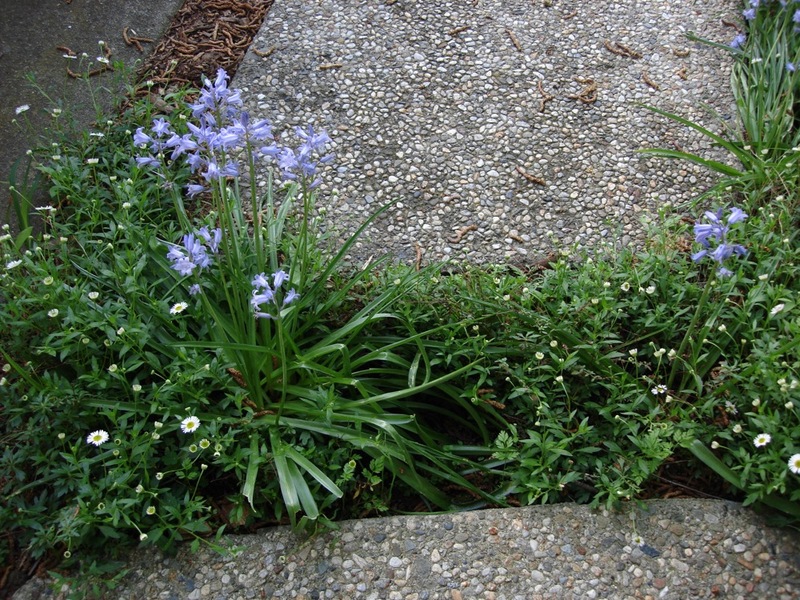 You can skip these photos and go to the bottom of the post, where I added another transferware Spring pattern. Bovey Tracey (1801-1836) "The Gem" 5 inch by 5 inch loving cup. "The Gem" patterns depict scenes from the four seasons. Here, maypole dancers illustrate Spring. 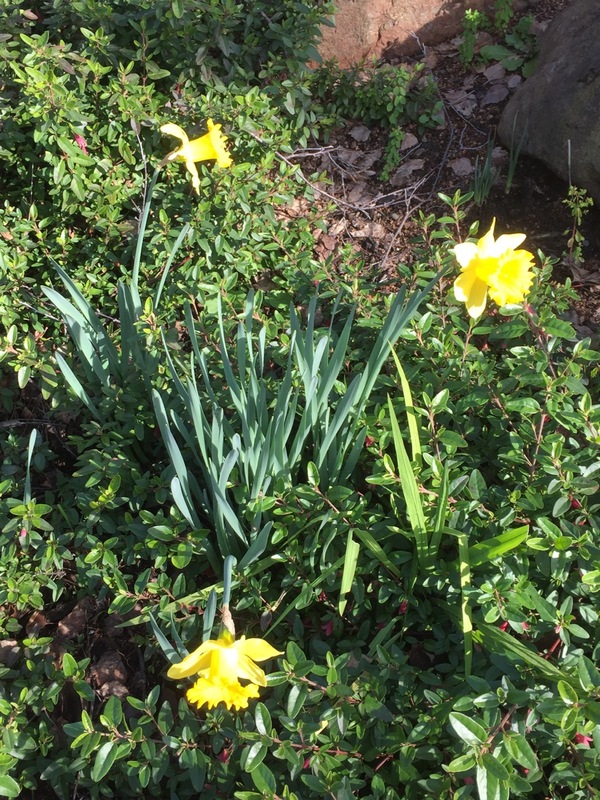 Spring is my favorite season, although I like all four. 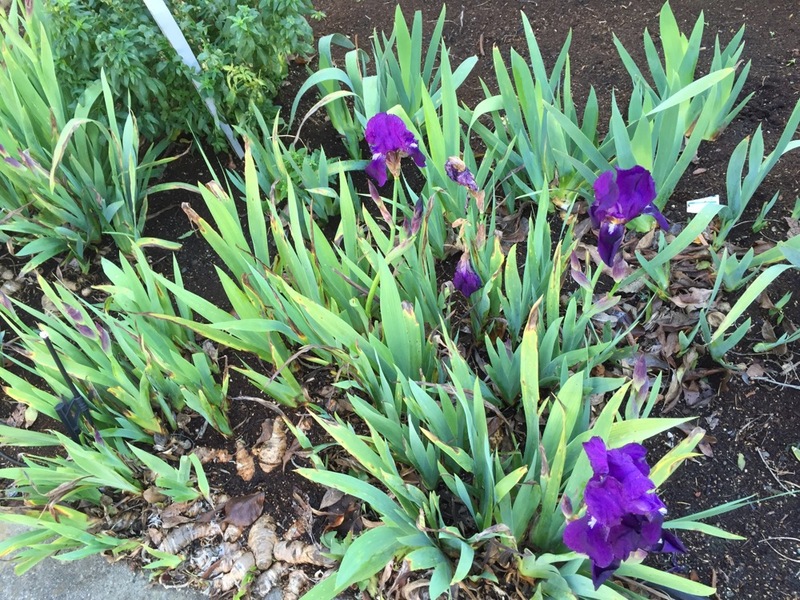 We are accused, here in Northern California, of having no seasons. We do have seasons, but they are subtle. Let the rest of the country be jealous! 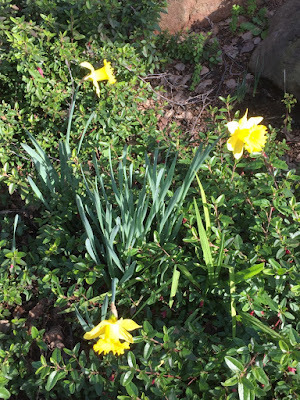 Two more Spring posts: Doves and Clematis. What is a pap boat? It has taken me quite a lot of time to figure this out, and I'm still not totally sure. It appears to be a small boat shaped item that was intended to supply pap to babies and invalids. What is pap? I have found more than one recipe (Robert Copeland* says it is a mixture of bread and flour soaked in milk with perhaps a small tot of rum! ), but is is basically a mixture of flour and boiled water plus, on occasion, sugar or bread. Pap was intended as a supplement for milk if a child failed to thrive. Most of the pap boats have a spout on one side and a curved area on the other side instead of a handle (although some do have handles). The curved area would make the small item easy to rest in the palm of the hand. My interest in pap boats in part of my interest in medical items. For example, I have already written about toast water jugs and baby or invalid feeders. 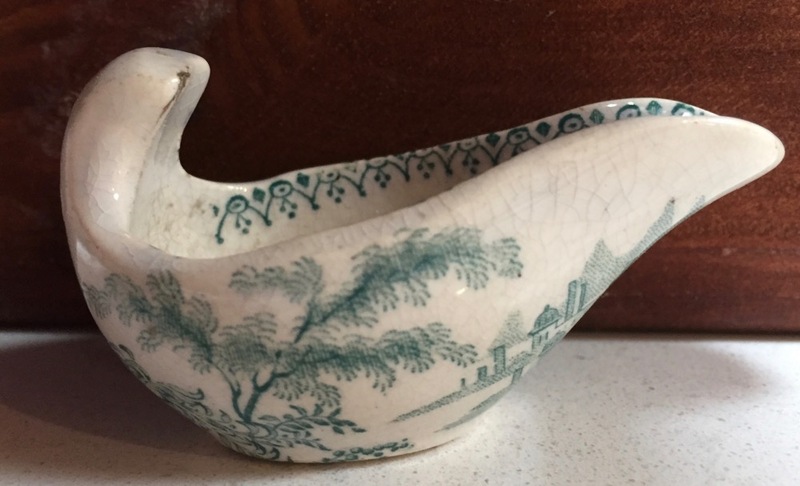 But, it was a gift of a small teal printed object that led me to learn about pap boats. I thought the object might be a butter boat because of its small size, 2.5 inches by 1.25 inches by 1.5 inches high, or a creamer from a child's service. Once I learned it was a pap boat, I still wondered if it was intended to be a plaything for a child. I may be wrong, but I think it was just made to be used for infants and very young babies. This photo shows the other side of the pap boat (anyone know the pattern?) plus how small it is. For example, the mug on the left is 2.5 inches high. Here are some more examples of pap boats. 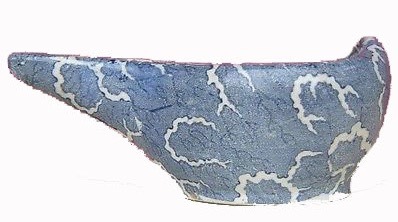 John & Robert Godwin (1834-1865) "Crete" pattern 5 inch by 3.5 inch by 1.25 inch high pap boat. The Transferware Collectors Club entry for this pattern says "Pap was a glutinous mixture of flour or bread and water sometimes with egg or beer." 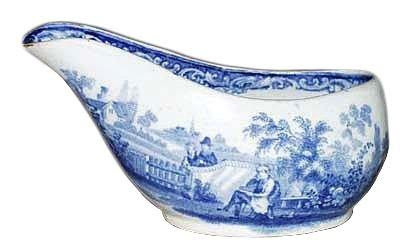 Unknown Maker, 19th century sheet pattern pap boat. William Ridgway Son & Co. (1838-1848) "Humphrey's Clock" pattern 3 inch by 2.25 inch by 1.5 inch high pap boat. I found more information about pap boats in "Antique Medical Instruments" by Elisabeth Bennion, which was published in 1979 for Sotheby Parke Bernet Publications by Philip Wilson Publishers Ltd. Russell Chambers, Covent Garden, London. Notice that pap boats were made in silver and other materials, not just ceramics. 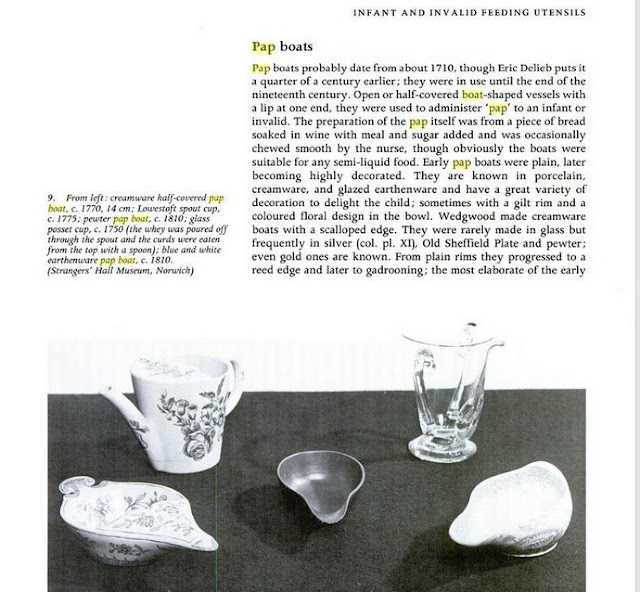 If you want to know even more about pap boats and baby feeders, here is a link to an excellent article titled "A History of Infant Feeding" by Emily E. Stevens. As much as I love pap boats, I'm glad we don't have to use them today! 1939 movie poster for "The Wizard of Oz"
I recently watched the "The Wizard of Oz" on my iPad with my seven year old granddaughter. We have watched it together before. She loves Glinda the best because she is a good witch and beautiful. Dorothy is my favorite character. And Toto. Both are brave. They act to protect others, even when they are afraid and in danger. I also love that Dorothy has such a strong wish to go home to her loved ones. If you have been reading my blog, you know I can find transferware patterns that relate to almost everything. The patterns and the words seen here are a bit sweet, but they echo Dorothy's wish. David Lockhart & Co. (1876-1898), Victoria Pottery Scotland, 5.5 inch porringer. Maker Unknown 5.06 inch plate printed with the words: "The dearest spot of earth to me/Is home, sweet home." The text is from a poem titled "Dearest Spot On Earth to Me Is Home" circa 1857 by William Thomas Wrighton. The entire text reads: "The dearest spot of earth to me Is Home ... sweet Home! The fairyland I long to see Is Home! ... sweet Home! 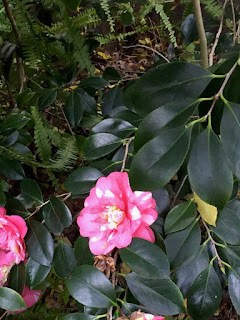 There, how charm'd the sense of hearing! There, where love is so endearing! All the world is not so cheering As Home ... sweet Home. The dearest spot of earth to me Is Home ... sweet Home. The fairyland I long to see is Home sweet Home. I've taught my heart the way to prize My Home ...sweet Home. I've learn'd to look with lover's eyes On Home ... sweet Home! There where vows are truly plighted, There, where hearts are so united, All the world besides I've slighted For Home ... sweet Home! The dearest spot of earth to me Is Home ... sweet Home. The fairyland I long to see is Home sweet Home." 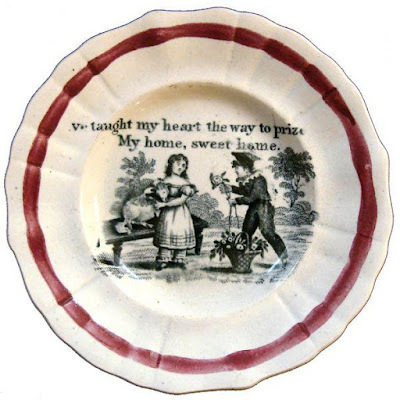 Maker Unknown, 4.94 inch plate printed with the words: "I've taught my heart the way to prize/My home, sweet home." I have watched "The Wizard of Oz" more than a dozen times. I never find it boring. Two of my favorite lines in the movie, "There is no place like home" and "I don't think we are in Kansas anymore" are as meaningful to me today as they were when I first heard them in 1948. 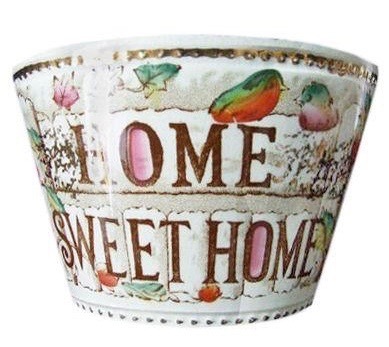 As a four year old, I understood the love of home with a pure passion. Now, I just miss my wonderful childhood and family of origin. I also understood that Dorothy was not in Kansas anymore. 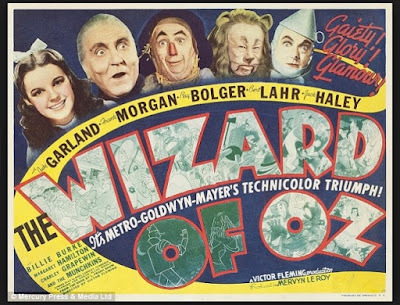 Kansas was in black and white and Oz was in technicolor! I learned early that life can be viewed in black and white and in technicolor. 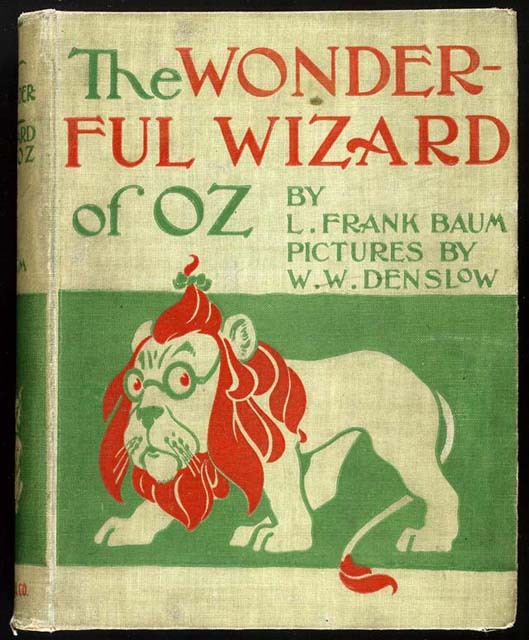 You can stop reading here unless you want to know more about the "Wizard of Oz." 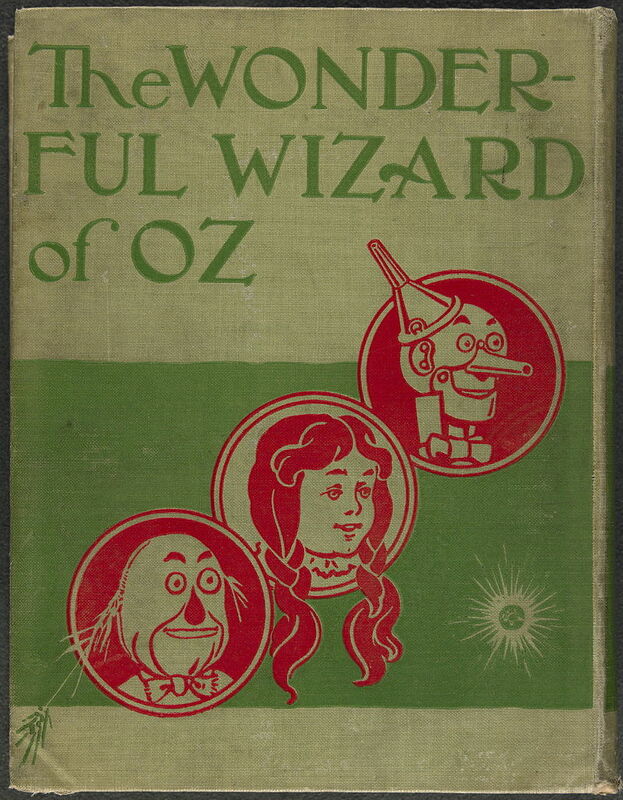 As a seven year old, I discovered that my library in Philadelphia had a large collection of Oz books. I read all of the books in my local library, so the librarian sent a request to the main library for more. I read most of the Oz books by the time I was ten. I think there were 37 or 38 books. I even bought, with my own money, a few Oz books at Leary's Book Store (a place as magical to me as Oz). I still have the books. Here is the back cover of the book. I love sharing the movie with my granddaughter. We have even read the book together. I shall add that my oldest son was also passionate about the Oz books and the movie. It just has been a long time since we watched the movie together.